To Lanette and me, the survival of the Angus Breed is based on what made it as prominent as it is today: Angus Cow. So when we say, “Sound, Proven, Maternal Genetics” this is what we are referring to. SOUND: By this, we mean structurally correct. I think it speaks volumes that no one has come up with an E.P.D. for structural soundness. I believe it is the first and most essential consideration in a breeding program. Interestingly, structural correctness can only be evaluated by a good eye for it–not by some quantifiable number. We evaluate soundness by some basic optics: Level top lines with a tail head pointing at the horizon, not the moon. Feet and legs that point the same way as the cow faces with ample room between them, giving her the capacity to convert forage to sustain her in harsh environments. An udder with a level floor, strong center support and high tight attachment and teats about the size of your thumb that are evenly placed on the udder floor. She is wedge shaped, wider through her hips than her shoulders while still maintaining what we refer to as “base width,” or a wide chest floor and smooth shoulders. Feminine necked and a wide muzzle for grazing also are important characteristics when we evaluate our females. We do not hesitate to cull those cows that do not adhere to these criteria. 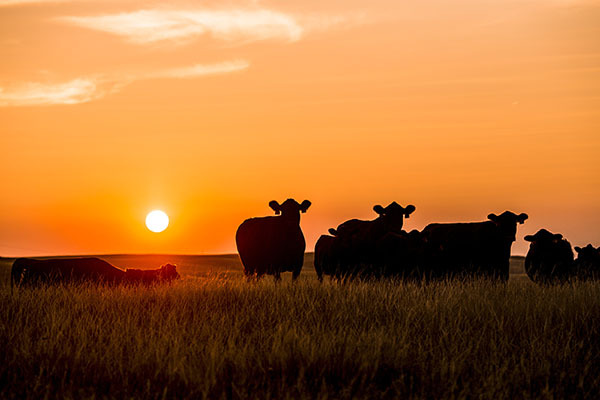 It is evident to us that the cows that possess these characteristics are more fertile and thereby lend themselves to another trait that is as important to profitability as any, that being longevity. Research has shown that a cow, on average, is not profitable until she is 4 to 5 years of age. Culling her at a young age because she didn’t breed or has broken down structurally from bad feet, a bad udder or is stifled from bad leg structure is costly no matter what her E.P.D’s are. • “Wye” through Viking GD60, Shoshone Vantage, Forever of Wye, Commodore of Wye and Fabron of Wye. • “Emulous” through Emulation 31 bloodlines and P.S. Power Play and “Bandolier” through Band 105 and Traveler 23-4. We do not use Sires or Dams with genetic defect carriers in their pedigrees regardless if they have been DNA tested free or not. MATERNAL: While quite often maternal is used in general terms, to us it means calving unassisted, promptly getting up to dry her calf off and getting the calf up to nurse. Perhaps maternal can best be described as mothering ability. Her disposition should be such that she is attentive to her calf without being hostile or a threat to us. While maternal is often associated to mean milk production, we believe, as stated before, that without sound functional udder structure the level of milk she produces is irrelevant. Finding the balance between adequate milk production to raise a good, healthy calf and udder structure that enhances her longevity is what we strive for. As you have probably ascertained by now, we are not a breed by the numbers producer of seedstock. Our environment and resources dictate the type of cattle that are the most profitable. I couldn’t look at a bull or cow and tell you what frame size they are and I’m damn sure not going to start carrying a tape measure around to find out. All I know is I don’t like them small and I don’t like them tall and hard doing. Logically, it would seem that length, depth and thickness dictate weight and that is the visual measurement I go by. If pressed, I would describe our cattle as being the “big side of the middle of the road” when it comes to frame.